Making a budget and diving into piles and piles of papers (or websites) with numbers that may make you want to curl up in a little ball and dry can be daunting. For some of us (meaning me), I need to dangle a carrot in front of my face to remind me of why I’m saving this money – and I need that carrot to be shiny, fun and awesome – which is why I use Pinterest. I started my personal Pinterest board about a year ago when I read an article about how to use it as a visual supplement to your resume; however, in the process of making that resume, I got completely hooked on Pinterest. Two of the next boards to quickly follow though were Future Travel Plans and My Wishlist – both of which help remind me of why I’m trying to remember to clip coupons or why it’s worth it to walk to work when possible or why, when I just desperately want to take a nap on my day off, I should spend an hour checking up on my budget and other financial information. 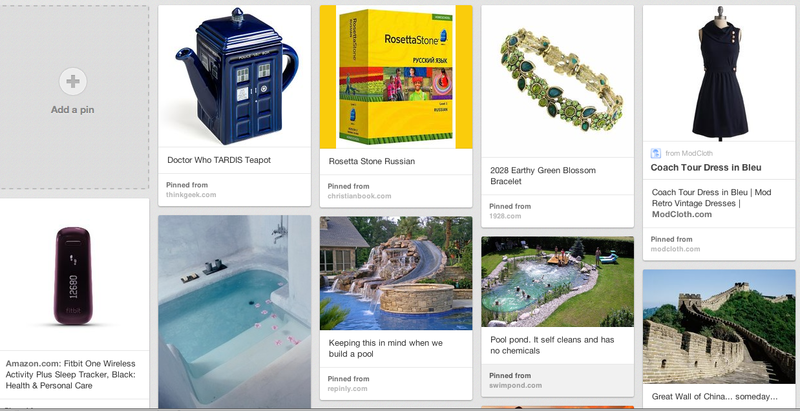 Some of my short term and long term goals: knick knacks, jewelry, travel and awesome pools for my imaginary home. If Pinterest isn’t your thing (good for you for avoiding the black hole), think back to your 13 year old self who cut out every N’Sync or Backstreet Boy photo, glued it on some cardboard and slapped it up on your wall. Now turn that obsession towards travel, home repair and even jewelry magazines and make a dream board of pictures that represent your budget goals. A big red circle going through the word debt isn’t really what we’re going for here – the bungalows in Bora Bora after you achieve that big red circle going through the word debt is really what we want to picture. Or the Jimmy Choo shoes. Or the gorgeous backyard barbeque pit. Or a pony. You know, whatever floats your boat. 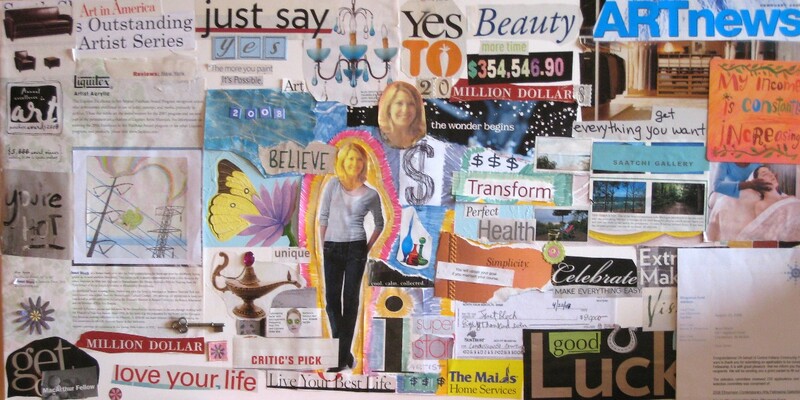 Old School Vision Board (Circa 1998) – Bust out your Mod Podge and go to town! If Pinterest and Mod Podge are not your thing (because, honestly, if Mod Podge is your thing, you are probably on Pinterest), there’s always the very low tech, very easy method of ripping pictures out of magazines as you come across them and sticking them to your fridge with a magnet or a piece of tape. Your fridge is prime real estate – you see it multiple times a day (your dream board collage could also find a happy home here). Whatever approach you want to use, visualizing your goals will help you achieve them. My dream board even has a few smaller items that I can practice setting a smaller budget to achieve (like this dress from ModCloth that I’ve wanted forever), along with the bigger items (someday, Great Wall of China, someday). 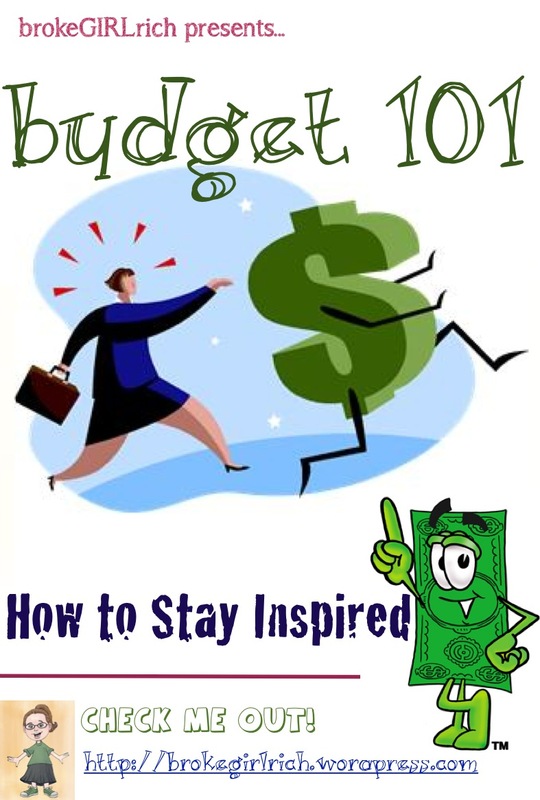 For more tips on how to achieve your budget goals, enter to win a copy of Judy Lawrence’s The Budget Kit. Contest ends October 31st. brokeGIRLrich readers, what’s your favorite thing on your dream board (even if your board is only in your head)? Did you ever make collages of bands when you were in junior high? What’s the best item you ever budgeted for? I totally have a dream board. It sits right in front of my desk to keep me inspired. Pinterest is amazing too. Having a visual reminder of your dreams is always a great incentive. What a wonderful idea! A Pinterest board of WANTS and WISHES!!! Clever, I will have to work on this over the weekend. I am loving the Earthy Green Blossom bracelet. Thank you for stopping by and entering my Giveaway. Good luck to you! Thanks for stopping by here too! You can find the Earthy Green Blossom bracelet at 1928 Jewelry (http://www.1928.com/bracelets/2028-earthy-green-blossom-bracelet.html) – they’ve got lots of cool stuff. I just want to clean out my whole house. That is the only wish and goal I have at the moment. It is so hard with so many keep sakes involved. That’s a pretty big goal. With a whole house to clean out though, you could make a little extra cash if you decided to sell some of those items on eBay or Craigslist. Good luck with the cleaning! I used to make dream boards and now I just use Pinterest! In my head dream board, another vacation to Jamaica with my hubby is #1 for sure. Thanks for sharing and stopping by Family Fridays!!!! Thanks for stopping by here! And a trip to Jamaica sounds awesome! Good luck saving up for it!